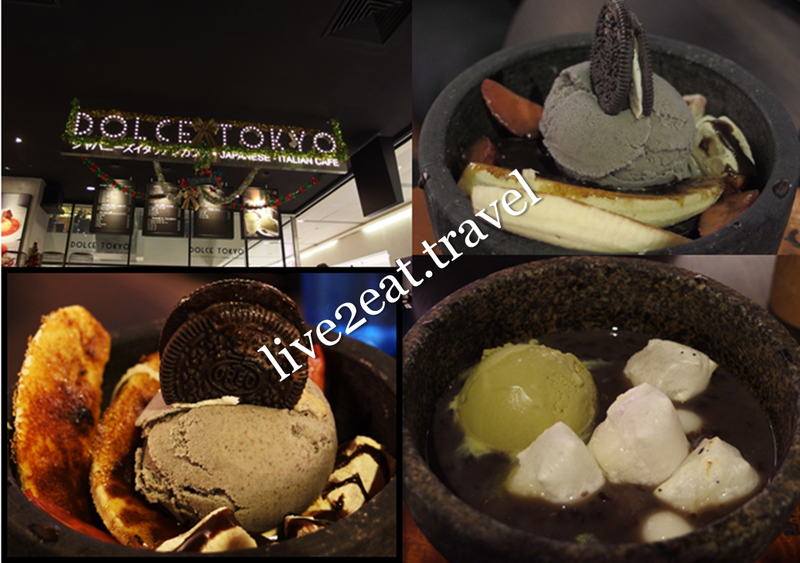 After dinner, my dining companions and I were looking for another place to chill out when we chanced upon Dolce Tokyo. Opened by Ministry of Food, the Japanese-Italian café can be found on the 3rd floor of Bugis Junction and 313@Somerset. It was the latter that we visited, and ordered two desserts for sharing. Chocolate Brownie Grande, served in a stone bowl that reminded me of Korean bibimbap, had a scoop of smooth gelato on top of sweet and dense (but not overly so) brownie with caramelised banana cut lengthwise and sweet sliced strawberries as well as gyuuhi and marshmallows lightly-toasted so it had a nice charred aroma and melted in the mouth. We chose black sesame over vanilla, chocolate and the default-if-you-forgot-to-choose matcha for our gelato. Could not fault Abekawa Macha Zen – Hokkaido red bean paste with Japanese rice dumpling topped with Hokkaido green tea gelato and toasted mochi. Oh, and there are savoury items on the menu too.